Blog | Drama Classes For Kids | Child Education Franchise - 5 Pyjama Drama personalities - which one is yours? This is the kid who will talk your ears off at home, but is silent in public. They watch other kids joining in and having fun, while they hide under a chair. But they're doing important work under there - observing the scene, and building the courage to join in. They can see the fun and they want it. Pyjama Drama will meet them in their territory – in their imagination. Suddenly they'll have a great idea that saves the day and the idea is out of their mouth before they’ve had chance to think about it. And once they’ve taken that first brave step, there’s literally no stopping them. This is the kid who has just learned to talk and now they just want to do it all the time! These kids find it hard to listen. At the end of Pyjama Drama sessions we ask to see what we call 'Thinking Faces', asking the children simple questions about what happened in the drama that day. Chatty kids love to share what they know, and if they can’t answer, it drives them crazy! Gentle encouragement and positive reinforcement helps these children to also learn to listen and to give other children a chance to contribute. This is the kid who finds it hard to sit still. 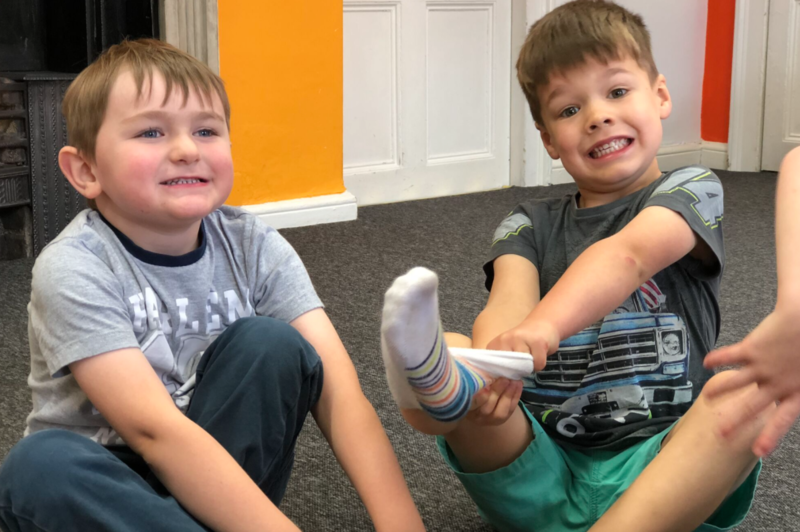 We make sure that kids get chance to practice sitting still in Pyjama Drama, but the sessions always follow the same format, so they know that there’s some physical activity to come. In this way, they find they can sit down to learn a song, because there’s bound to be an adventure coming up soon! This is the kid who is always desperate to learn something, the ones with the constant questions about everything. Pyjama Drama lesson plans cover every Area of Learning in the EYFS and many of the topics that will be familiar to children from nursery and school. These kids don’t have any major difficulties. They’re doing just fine, thank you. These children are especially bright. They’ve mastered everything so far, and they're looking for their next challenge. Pyjama Drama provides rare opportunities to practice leadership skills at a young age. These kids can lead everybody through the swamp, or the jungle, or the forest and make sure that everyone is included. Furthermore, our sessions develop critical thinking skills, all whilst having lots and lots of fun! So you see, no matter which personality best describes your child, they'll thrive at Pyjama Drama. We hope to see you soon!